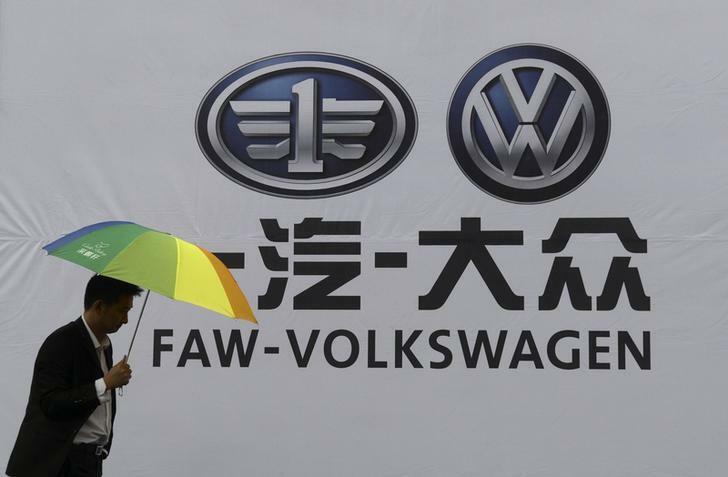 SHANGHAI/BEIJING (Reuters) - Chinese automakers from state-owned FAW Co to Zhejiang Geely are racing to sell more eco-friendly cars as they try to meet tough fuel economy rules due next year as part of Beijing's battle against pollution. But many of China's smaller indigenous automakers will struggle to make the costly upgrades needed to meet the new rules, which aim to push more efficient energy use and which are expected to be toughened every year through 2020. A technology deficit versus bigger foreign automakers and the cost of developing or obtaining the new technologies needed are likely to speed up consolidation in a fragmented industry of more than 80 registered manufacturers. The Chinese government last week unveiled tough penalties tied to the new fuel economy rules - from naming-and-shaming those who fail to make the grade to restricting production at non-compliant automakers. "Restricting production is a very severe penalty," said He Hui, an analyst at the International Council on Clean Transportation, an adviser to China's government on fuel-economy policies. "Chinese carmakers lag far behind foreign firms in their technology repertoire, so the rules add pressure to those already struggling domestic brands." By next year, all car makers in China, the world's biggest autos market, will be required to achieve average fuel economy of 6.9 liters per 100 km (around 41 miles per British gallon or 34.1 miles per U.S. gallon) across their product line-up. By 2020, the target will have been made more stringent to 5 liters per 100 km (56.5 mpg in Britain or 47 mpg in the U.S.). That means each car maker will have to improve fleet average fuel economy by more than a third by the end of the decade from today's levels, said James Chao, regional director at IHS Automotive, estimating it will cost "billions and billions of dollars" for the industry as a whole to comply. "Who's at a disadvantage? ... the local lower volume (manufacturers)," said Chao. "This may well be the catalyst for them to either find a partner or to be acquired." Nearly 30 percent of carmakers in China failed to meet suggested fuel economy targets for 2013, and most of those were Chinese, including Lifan Industry Group Co Ltd and state-owned GAC Group's passenger car unit. Some foreign makers, too, especially luxury car producers, are likely to struggle to meet the new rules, and are rushing to adopt green car technologies, according to Chao. Highlighting the challenges facing even some of China's bigger automakers, already struggling to compete with global brands, Beijing-based BAIC Motor Corp, Daimler's local partner, has said the fuel economy rules are a major business risk that could result in product delays and big increases in component and design costs. Auto manufacturers, most notably those from overseas, are adopting electric propulsion technologies, such as all-electric cars and plug-in hybrids, in the expectation that regulators will provide them with extra fuel-economy credits when it comes to measuring up for the new rules. But these new technologies are costly, difficult to master and not without risk. That's why others are turning to more accessible, but high-impact, technologies - like Hangzhou-based Geely, which is ready to embrace conventional gasoline-electric hybrid know-how - the same technology Toyota Motor uses in its Prius - even though China's industrial policymakers don't currently endorse the technology with generous purchase subsidies. Geely spokesman Victor Yang says the company plans to start selling in the latter half of next year a hybrid version of its Emgrand 7 midsize sedan, which will offer more than a third better fuel economy than the gasoline-only model. The new hybrid technology "will be migrated to other models" later to sell more high-mileage cars and help Geely clear the new fuel-economy hurdles, Yang added. FAW has asked Japan's Daihatsu Motor to provide small-car powertrain technology so it can revive its Tianjin Xiali small car unit and help FAW Group meet the 2020 fuel economy rules, two executives at the Japanese firm said, adding that Daihatsu has tentatively agreed to provide FAW Xiali with newly developed automatic transmissions, and the two companies are putting the finishing touches to a deal. FAW is also asking Daihatsu for 1-liter gasoline engine technology, drive shafts and other technologies to upgrade FAW Xiali's small cars, the executives said, asking not to be named as talks are ongoing. A Daihatsu spokesman in Japan said there is "nothing decided beyond the gearbox deal" it struck with FAW earlier this year. FAW officials did not respond to telephone calls.